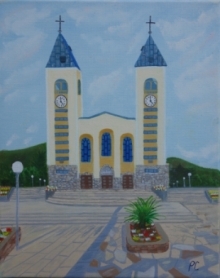 Besides few pilgrims who come in this quiet time on purpose, to experience more peace and have time for personal prayer, life in this parish is not different than in other Herzegovinian parishes. The sacramental and pastoral life are according to the ordinary schedule of the evening prayer programme, priests are confessing in the afternoon, the Way of the Cross on Cross Mountain on Fridays, as well as in the church after the evening Holy Mass, Rosary on Apparition Hill on Sundays, and every 25th in the month, there is whole night Adoration of the Blessed Sacrament. The Information Office registered smaller groups of pilgrims from Italy, the United States, Korea, England and Poland.